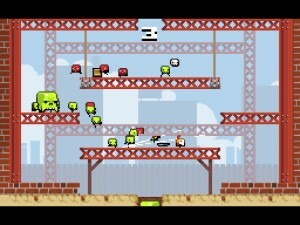 A shoulder surfer would describe Super Crate Box [$.99] as a mess, a pixelated mash of vivid colors and explosions wrapped in a whirlwind of erratic movement, 8-bit sound, and some decidedly bizarre character design. They’d be right. Super Crate Box is a mess, but it owns its fast-moving arcade chaos, and deftly brings you along for the ride. You don’t even realize that you embraced it until it’s an hour later and you hate that godforsaken disc launcher with the passion of many angry men. What renders you helpless has a lot to do with its infinite, looping structure and purity of play. This is a minimalist, throwback-style game that wants you to do one thing: capture crates for a high score. The hooks are in its constituent parts, which seamlessly blend into a cacophony of arcade action surrounding this pure purpose of play. It becomes hypnotizing, fast. 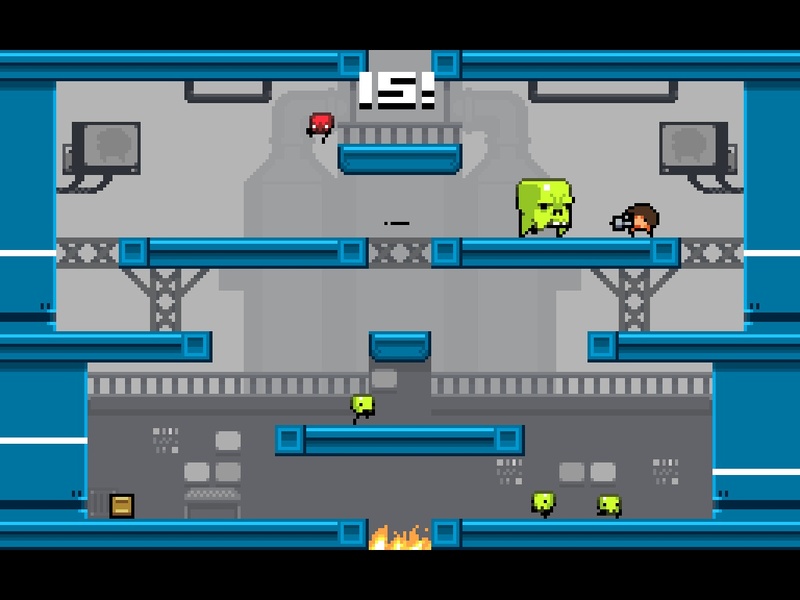 Your typical game goes a little something like this: on a flat plane, enemies tumble out of an invisible pipe in the opening of a level, and you, while they fall, capture crates and defeat those enemies with the weapons you pick up from said crates. 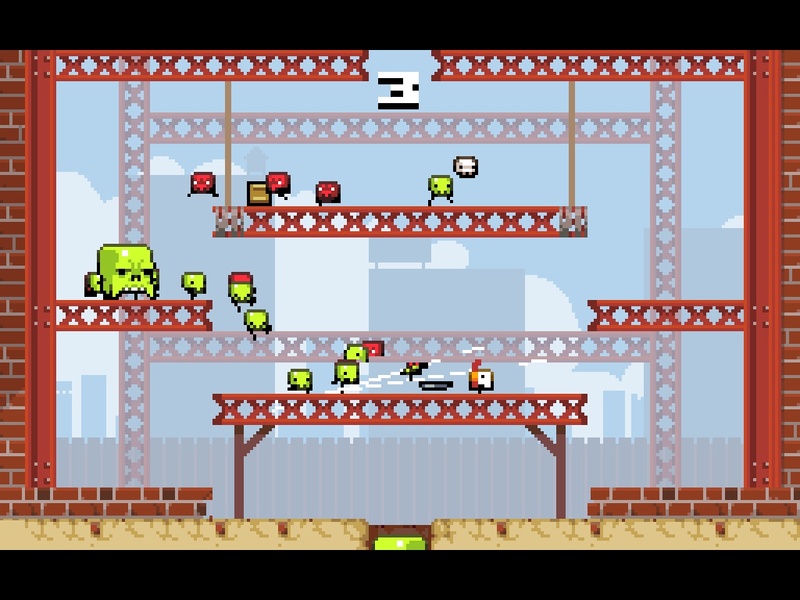 If an enemy hits the lava pit because you didn’t kill it, it pops back out of the top at double speed and joins the ever-growing conga line of even more brainless enemies. Avoidance is key, but so is aggression. Each crate contains a new weapon that forces you to strategize distance versus time at the drop of a hat. As you play, you’ll unlock even more weapons, all of which do something completely different and are often devastating. Laser guns, mines, rocket launchers, grenade launchers, the shotgun are just a taste of what’s on the roster. Each has its own special kind of spread and weaknesses. Some even have big negatives, like the disc launcher, which is a single fire gun that has bullets that bounce back at you. 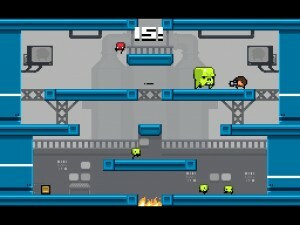 Whatever pacing you’re imagining, multiply that by 11 and you’ll get a sense of the raw madness that is Super Crate Box. One second you’re charging up a laser gun to rid a platform of its occupants, the next you’re dropping down to another level and using a mine in order to put a stop-gap on that side so you have enough free-time to grab a crate on another platform. The frenzy absorbs you, and the raw precision becomes a second nature thing. People say it’s a mess, and it is, but I’m OK with it. I welcome all of it. As you play, you’ll steadily unlock more guns and more characters to use in the game. It’s your usual incentive program, but where it departs is in the fact that it also rewards failure. If you die 500 times, for example, you’ll unlock Super Meat Boy as a character. Simply gathering crates, no matter how many times you die along the way, is also a valid way to unlock stuff. I’m surprised by how much I dig the virtual controls; Halfbot and Vlambeer did a heck of a job translating the action to the touchscreen and then making it feel as natural, and as split-second responsive as the game’s PC and Mac counterparts. On iPhone, the two-button UI is a tad too bulky. On iPad, the game feels at home. Regardless, these guys nailed it. This game feels good. Another place you can play is on the iCade. Currently, the controls have been flip-flopped inadvertently in an update, but when they’re working ideally, they feel great. I think this is the way to play since you get that tactile feedback. People in general are really responding to Super Crate Box, and our community digs it. I love it. Its high-octane play married with its no-frills, arcade game design keeps me collecting crates and blasting enemies into delightful little pieces of monster. I’m thinking it’ll grab you, too.